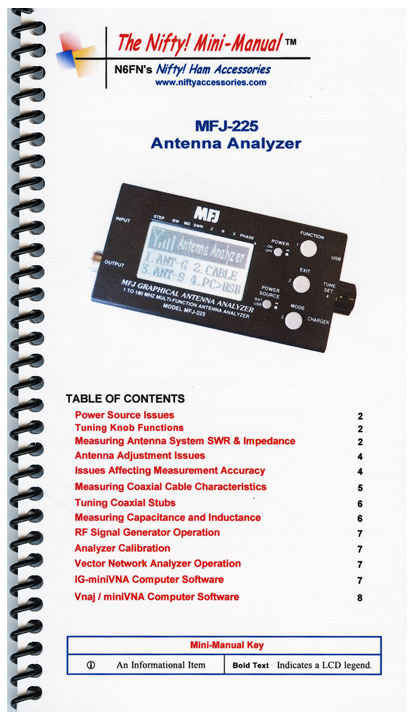 Take RF testing to the next level with the new MFJ-225 two-port graphic antenna analyzer. It has all the basic analyzer functions you've come to depend on plus a host of advanced features like builtin LCD graphics, two-port VNA measurement, PC-Interface using IG-miniVNA freeware, and precise DDS frequency control. It tunes from 1.5 MHz to 179.9 MHz with rock-solid stability and no gaps. That is because the MFJ-225's VFO is a state-of-the-art programmable DDS (direct digital synthesis) generator with pin-point 1-kHz frequency resolution. DDS control means no mechanical band switches or tuning elements, just a reliable velvet-smooth optical encoder to glide across the spectrum. In the field, the MFJ-225 is a compact completely self-contained handheld analyzer. On the bench it becomes a full-fledged two-port (S21) desktop machine when teamed up with your PC. Using powerful IG-miniVNA freeware, you will run detailed data analysis and then print out stunning color-graphic plots to document your work! The MFJ-225 runs from multiple power sources to suit almost any operating environment. In the field, it powers itself for up to four hours using three self-contained AAA NiMH cells (not supplied). On the bench, it accepts any convenient external 12 volt DC power source such as the MFJ-1312D. It also runs off your PC's USB jack. SPECIAL NOTE: The analyzer's OUT port is SO-239 (not N-female as shown in the MFJ supplied photo ABOVE). The IN port is SMA female.